Hello everyone Another season has begun! lettuce mix, spinach, asparagus, alfalfa sprouts, broccolini (it’s actually a broccoli – gailon cross), bok choi, radish, hakurei turnips, beet greens and an assortment of mild to spicy asian greens: arugula, mizuna, tokyo bekana, and a mustard greens mix. The tokyo bekana and mustard mix are new this year. The Tokyo bekana (the lime green leaves in the middle below) is a bunched loose leaf chinese cabbage with mild sweet flavor, The mustard greens mix (on my left) is a mixture of red and green mustard, chinese cabbage, pac choi and tatsoi and it’s spicy! It’s great in salad or stir fries. The mizuna on my right has the serrated leaves and is mild and nutty and the arugula is medium spicy. I’ve already heard from a few people who are so excited to have the hakurei turnips again – they’re sweet and juicy and great raw. This spring has gone by really fast and there’s been a lot going on! First of all there’s a couple new people working here this year. 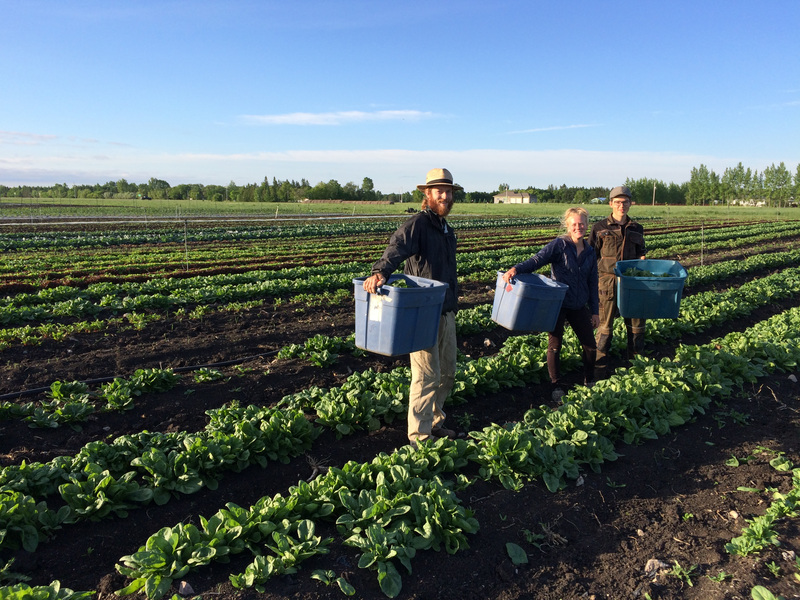 Just finishing up our first spinach harvest below form left to right are: Nicholas, Sarah and Jaroslav. Nicholas just built a tiny home near Gimli that he can drive around, Sarah, everyone knows and isn’t going on any hikes this summer, and Jaroslav is my young protege from Czech ( I just learned that it hasn’t been called Czechoslovakia for about 20 years). Am I the only one who didn’t know that? 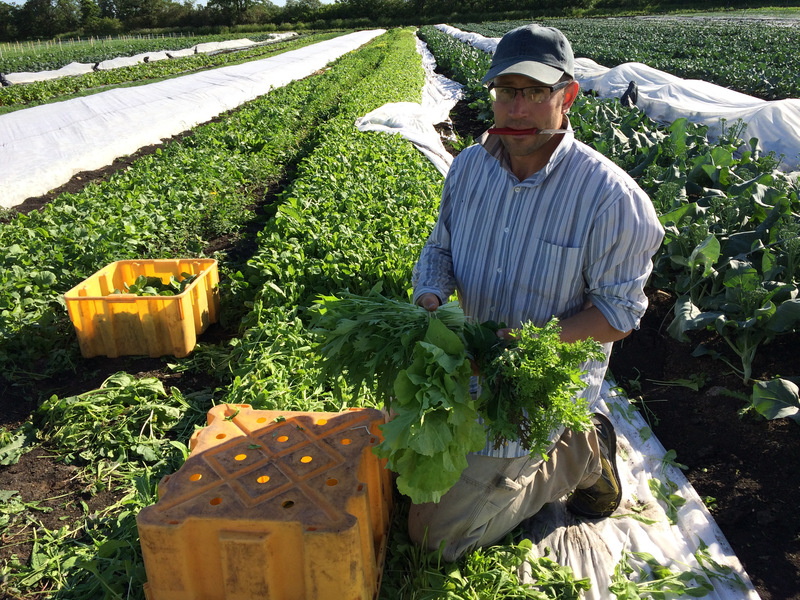 Jaroslav is studying organic agriculture and is here for practical work. He has studied a lot and knows too much; so I have to pretend I know what he’s talking about and keep telling him he’s wrong so that he thinks I actually know what I’m talking about. Nicole will be taking a break from the Market this summer, but might be making the occasional guest appearnce but Jaroslav will be taking her place so you will get to know him. Nicole will be there Tuesday to help with the first market so tell her you’ll miss her! Irina will also be back next week. Other than that there’s been a lot going on this spring! I’ve put up a new farm building that you can see in the background below and it’s going to be nice to have that space. The plan was to have it done about a month ago before we get really busy with harvest, but somehow what was going to take a couple weeks has taken a couple months and now I’m worried that juggling getting that finished while harvesting is really going to cut into my t.v time! Besides the new building it’s been a bit crazy here because I’ve found a new vehicle last minute. I ended up going with a cube van because we could use the extra space. But then I realized the cube van might be too tall to fit in the new building. Fortunatley I was able to change the door size last minute and make one 6″ taller. The timing wasn’t the best though -it really made the carpenters day when just after he finished the door I asked him to make it 6″ taller! 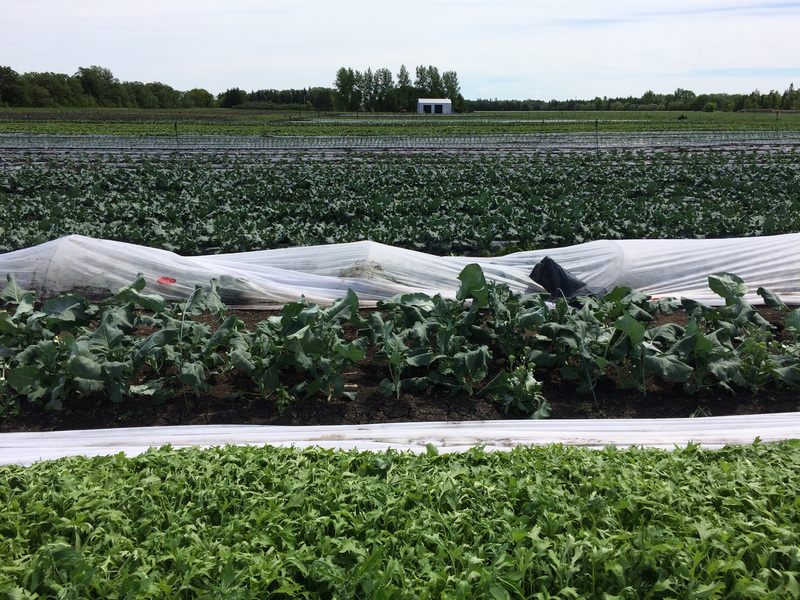 If you can tell what door in the background is 6″ taller you get a free bunch of radishes next week. But the gardens doing well and at least it’s not rained on us yet (is it really supposed to rain all day tomorrow?)!. That’s it for this week. I look forward to seeing everyone again and meeting all the new people at the pick up this week, so come say hello!